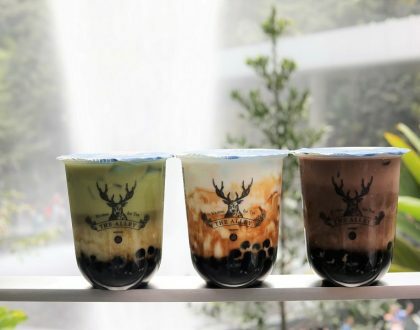 The ‘custom’ of afternoon tea has been enthusiastically adopted by Singaporeans, who have taken its practice to new heights. 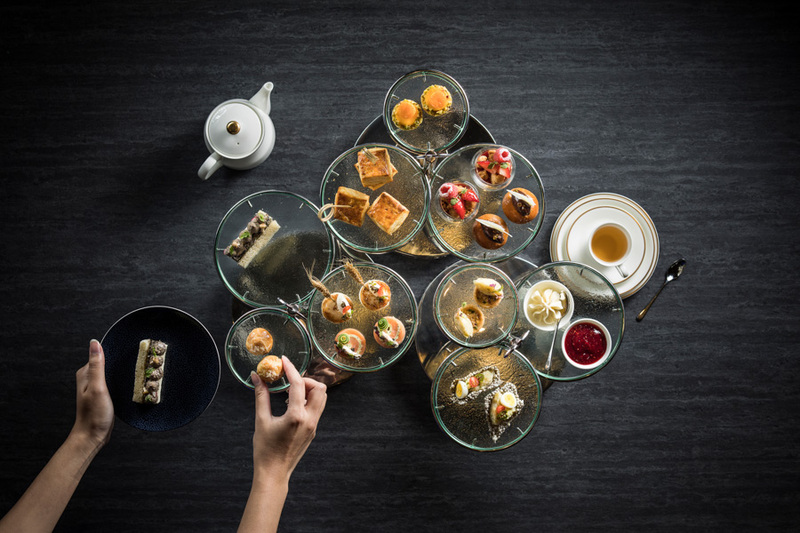 The list of options offered in the hotels all over Singapore is a testament to the growing interest in high teas – to many it is an event in itself. The traditional afternoon tea formula of tea + scones, savouries, and desserts has been tried-and-tested and proven successful, but some hotels do go beyond and offer something more. Some hotels offer alternatives like an Asian-inspired set such as a Hanami-inspired “Spring in Tokyo” hightea, while others focus on a theme like floral or seafood. 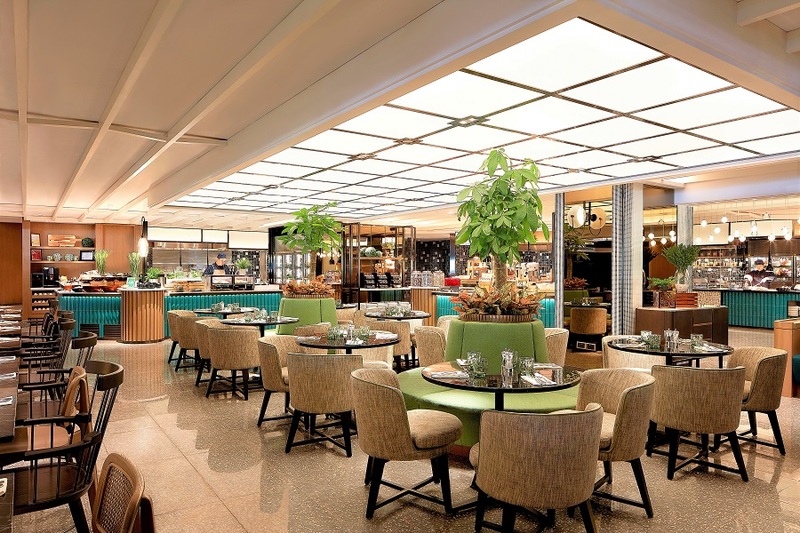 The Orchard Cafe at Orchard Hotel, which reopened in late 2018, is known as a legendary icon of local dining. It offers its signature hotel buffet showcasing heritage-inspired local creations and chef-curated cuisines from around the world. Re-designed using a “Food Garden” concept, it features a nature-themed interior and food displays. The bamboo-patterned counters depict handcrafted ingenuity. Its ceiling-to-floor window allows natural lighting to its indoor bar, and the al fresco seating section is a cosy spot to enjoy an afternoon tea. 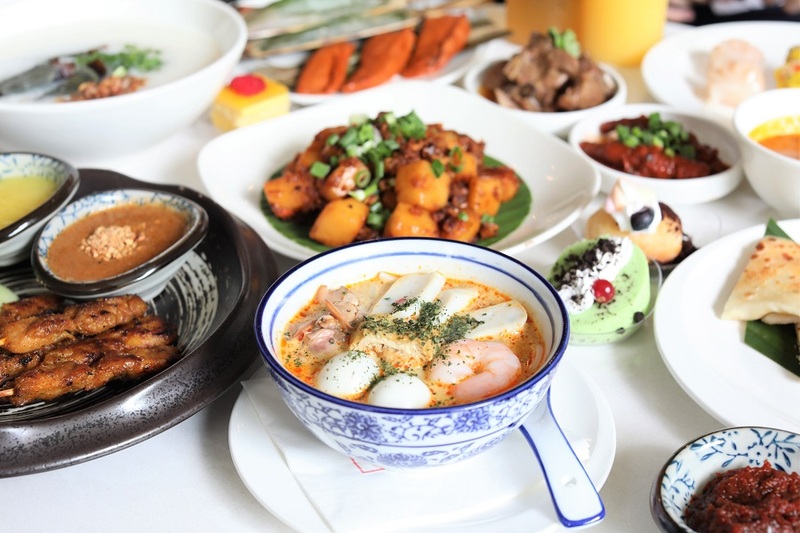 Savour The Orchard Cafe’s signature Porridge, or seek comfort in a local favourite, lemak Singapore Laksa with cockles, prawns, fish cakes and quail eggs served with noodles in rich fragrant spicy coconut gravy. For dessert, recommended items are Green Tea Tiramisu and Durian Pengat, a mousse-like durian dessert that’s smooth, creamy and luxurious. –	Offer is only valid on Weekends. –	Not valid on eve of and on Public Holidays and special occasions, unless otherwise stated. –	Limited to one card per bill per table. No Splitting of bill and table allowed. –	Discount, vouchers and privileges are not exchangeable for cash, kind or other goods and services. 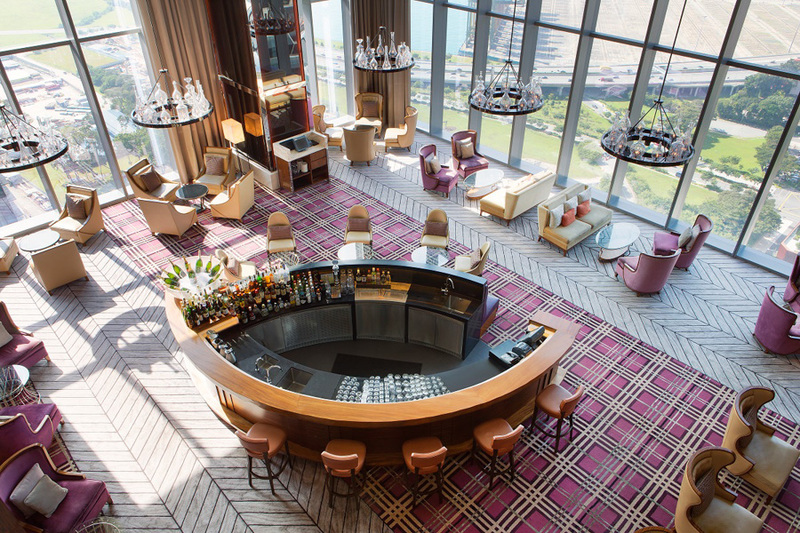 The Landing Point at The Fullerton Bay Hotel Singapore boasts a memorable dining experience with its gourmet food, impeccable service and resplendent waterfront views of Marina Bay. A popular choice for executives, it’s the perfect venue to see and be seen. Soak up the lush setting decorated with marble mosaics and gold hues, as you sit back and enjoy a sumptuous afternoon tea. 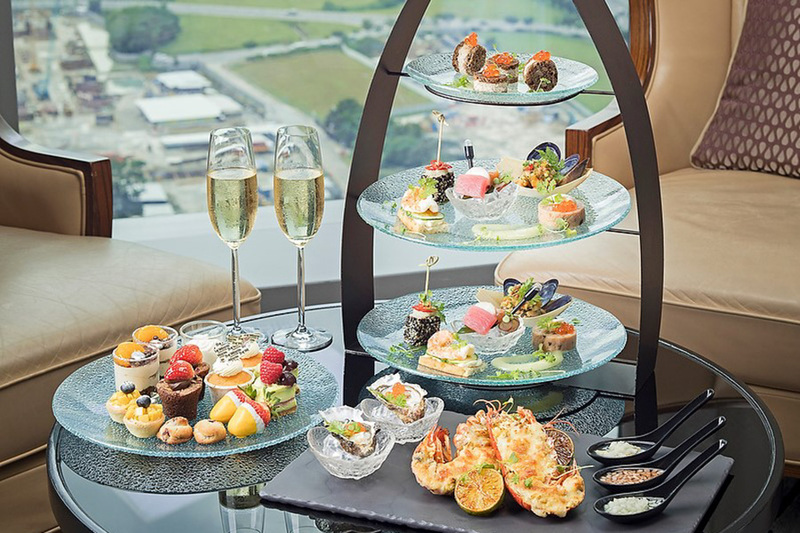 The “Afternoon Tea Affair By The Bay” is a delightful selection of traditional afternoon tea staples such as freshly baked scones alongside delicious savouries and sweets, and 10 varieties of TWG teas. For the savouries, highly recommended are the Boston Lobster Cornet A L’Oriental, Duck Rillettes in Sesame Bun, Smoked Salmon Mille-Feuille with Caviar, Mini Prosciutto on Bagel. For the sweets, try the Graham Cracker Key Lime Pie, Ondeh-Ondeh Macaroons, Fullerton Fruit Cake, and Pecan Maple Tart. As for your choice of tea, try the signature Fullerton Express Tea, white tea with crystalline infusion of aromatic wildflowers. If you prefer green teas, go for the Silver Moon that’s scented with berry, vanilla and a hint of spice, or the classic Moroccan Mint tea. –	Offer is not valid on eve of and on public holidays, as well as special occasions such as Easter Weekend and may include other blackout dates determined by the merchant, unless stated otherwise. –	Valid for dine-in only and limited to eight diners per bill. –	Prior reservation is recommended. 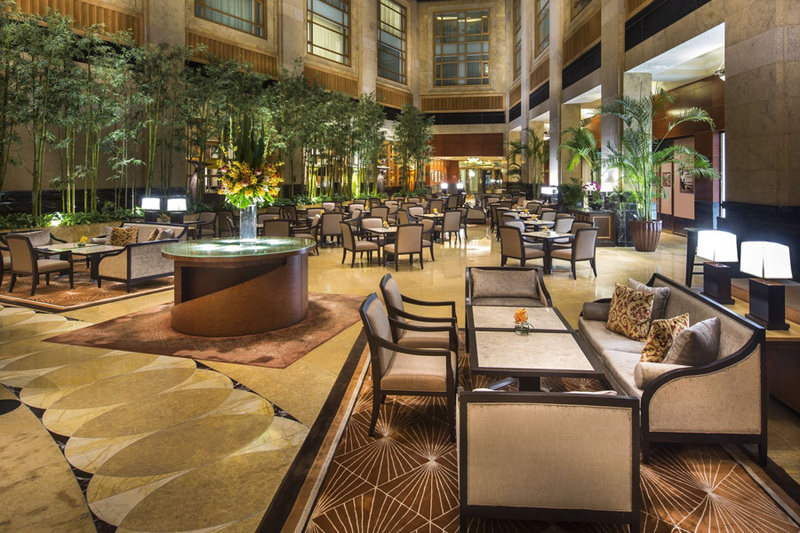 Bask in the sunlit atrium lobby of the Fullerton Hotel Singapore and have a leisurely afternoon tea at The Courtyard. Relax in their plush sofas as you enjoy a tête-à-tête with friends. On weekends, a harpist serenades you with relaxing melodies to further complement your dining experience. Your Traditional English Afternoon Tea at The Courtyard comes with unlimited replenishment of your tiered tea accompaniments (with vegetarian and gluten-free sets available) and free-flowing tea and coffee. You can choose from a selection of 15 TWG teas and 6 coffees. Try the Sencha Meicha, a delicate green tea with grassy notes from the Shizouka region of Japan. Celebrating a birthday? Make it extra memorable and get the Happy Birthday Tea, a mild black tea with a festive blend of sweet red berries and a hint of vanilla. Watch the world go by as you sip your selected teas or coffees and savour freshly-baked English scones, served with clotted cream and berry jam, and savoury finger sandwiches. Gluten-free options include Tiger Prawn with Avruga Caviar, Smoked Duck Mango Salsa with Brown Bread, and Poached Beetroot with Avocado Mousse. Other irresistible treats include the Chocolate Cake Barolo Red Wine Pear and Panna Cotta with Raspberries. Add $10++ for a glass of house wine, and $20 for a glass of champagne. –	Prior reservations is recommended. Catch up with friends at the chic Crossroads Bar, the latest addition to Singapore’s riverside bar scene, and discover its line-up of its charming afternoon tea. 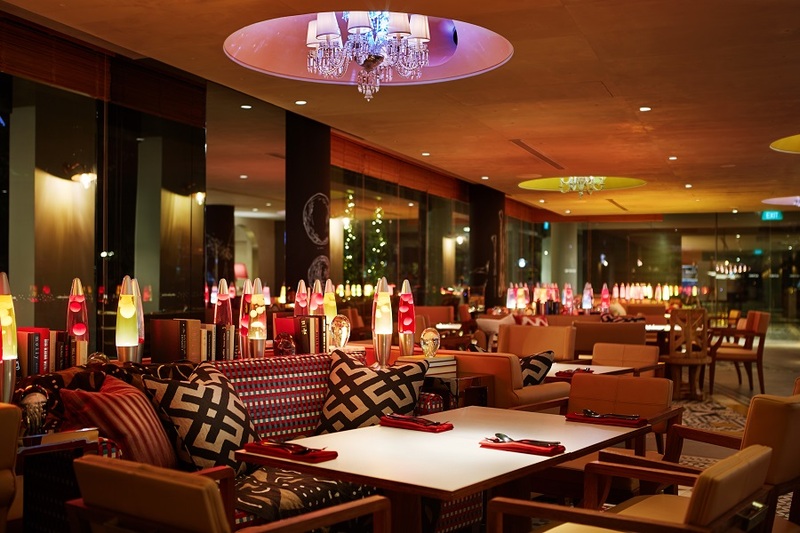 Its grand ceiling-to-floor windows and sophisticated vibe make it an ideal venue to meet up and unwind. 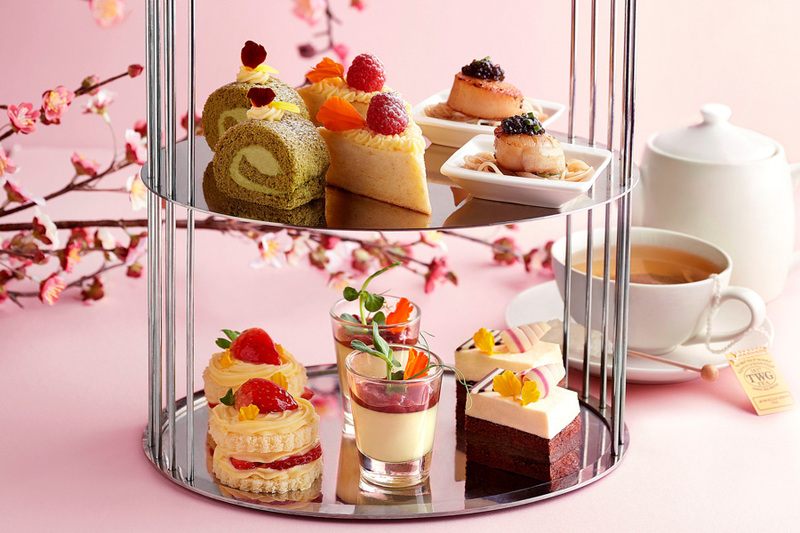 Their daily Afternoon Tea Set gives you a choice of English, Nyonya, or ‘Spring in Tokyo’ and a delightful assortment of savoury treats and dainty sweet confections. 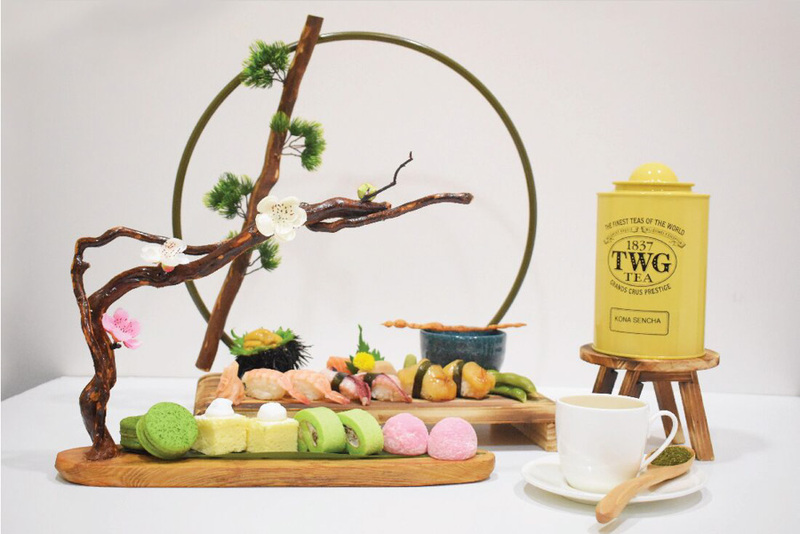 Seven kinds of TWG teas are available including English Breakfast, French Earl Grey, Jasmine, Vanilla Bourbon, Moroccan Mint, Emperor Sencha and Chamomile. 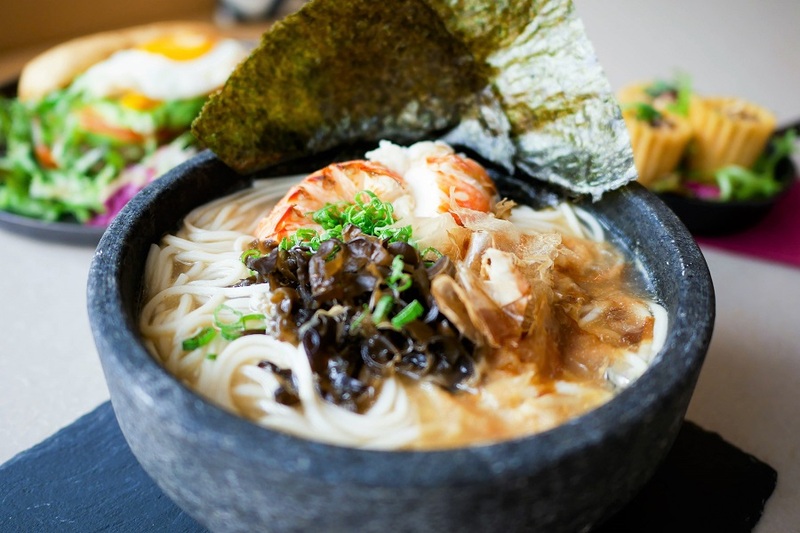 The seasonal special of ‘Spring in Tokyo’ Afternoon Tea Set highlights Japanese-inspired savouries such as the Truffle Sōmen Noodles with Scallop and Ikura, using the thinnest of all Japanese dried noodles. The inclusion of truffle and Japanese salmon caviar (ikura) make this an extra special accompaniment to your tea. 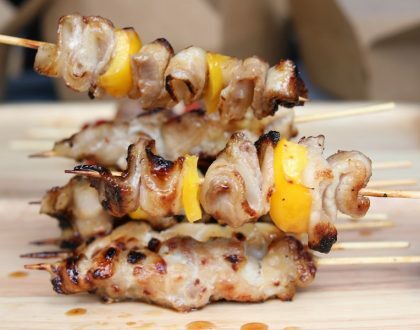 Other savouries include Unagi Kabayaki Open Face Sandwich, Fried Shrimp Sandwich with Wasabi Tartare, Buta no Kakuni (Japanese Braised Pork Belly), and Black Pepper Cod Teriyaki. On the sweeter side of the spectrum are the Japanese Sponge Cake, Black Sesame Tiramisu, Japanese Style Matcha “Swiss Roll”, and Strawberry Éclairs. – Valid from 1 March 2019 to 30 April 2019, and 1 September 2019 to 30 November 2019. 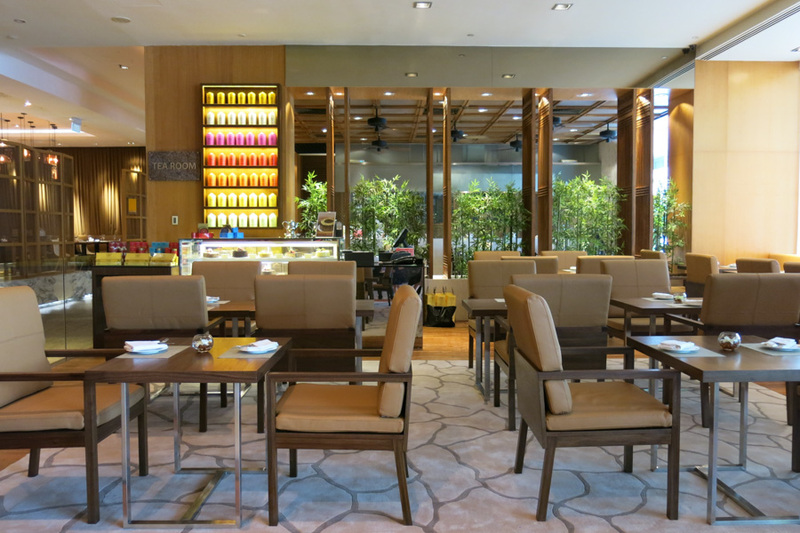 The next time you plan to cosy up for an afternoon of tea, try the Tea Room at Amara Singapore, your quick escape from the bustling neighbourhood. Their Afternoon High Tea menu includes a three-tiered tea set filled with savoury bites and a delightful selection of sweet mini cakes, pastries and scones. You get a freshly brewed pot of TWG premium tea of your choice, good for sharing with your tea partner. You’re given two choices for its Afternoon High Tea: English and Japanese. 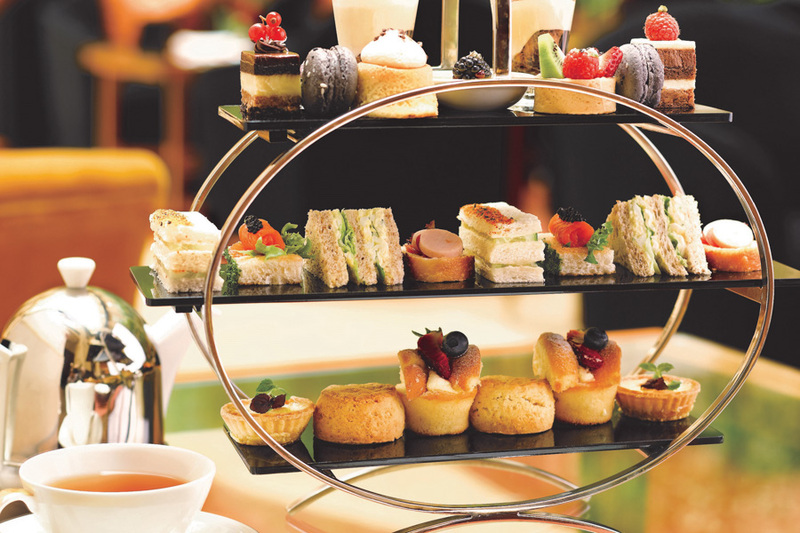 Choose the English High Tea Set if you enjoy Western treats like Brioche Toast with Foie Gras Mousse and Green Grape, Cucumber Crabmeat Cannoli with Salmon Roe and Spring Onion Spear, Mushroom Ragout Truffle Tart with Fresh Thyme Leaves, Rye Bread with Caviar and Dill, Smoked Salmon Rosette. Of course, you also get traditional scones with clotted cream and assorted jam. Other sweet inclusions are Berries Fruit Tartlet, Cheesecake, Chocolate Tart, Coconut Macaron, Cream Puff, Panna Cotta in Shooter Glass, and Pistachio Financier. For a more Asian feel, go for the Japanese High Tea Set that comes with assorted sushi (prawn, scallop, and octopus), sashimi (salmon, tuna), Unagi Canape, Soft Shell Crab Roll, Cold Soba, Edamame, and Spicy Tuna with a 63-degree poached egg. Japanese desserts like matcha Swiss rolls, matcha macarons, Azuki mocha, and Japanese cheesecake complete the set. For your pot of tea, try Kona Sencha, a green tea with a special sharpness and a touch of astringency best paired with fish and sushi. –	Not valid with other promotions, privileges, discount cards and promotional vouchers, whichever is applicable. –	Not applicable during eve of and public holidays; and special / festive periods. –	All prices quoted are in Singapore dollars and subject to service charge and prevailing government taxes. –	Amara Singapore reserves the right to change the Terms and Conditions without prior notice. Formerly known as Axis Bar & Lounge, MO BAR is all about curated cocktails, eclectic bar snacks, and an afternoon high tea. 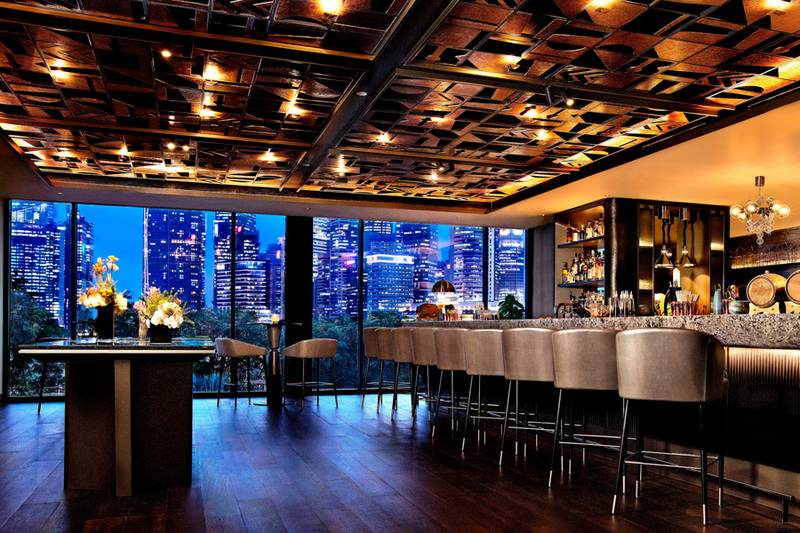 Located at the 4th level of Mandarin Oriental, Singapore MO BAR is designed with floor to ceiling windows that allows magnificent view of Marina Bay and the city skyline. As you enter, you’re welcomed by a display of TWG Tea products which you can whiff to sample. There are 19 options available – unless you already have a favourite, you could have a hard time picking one. 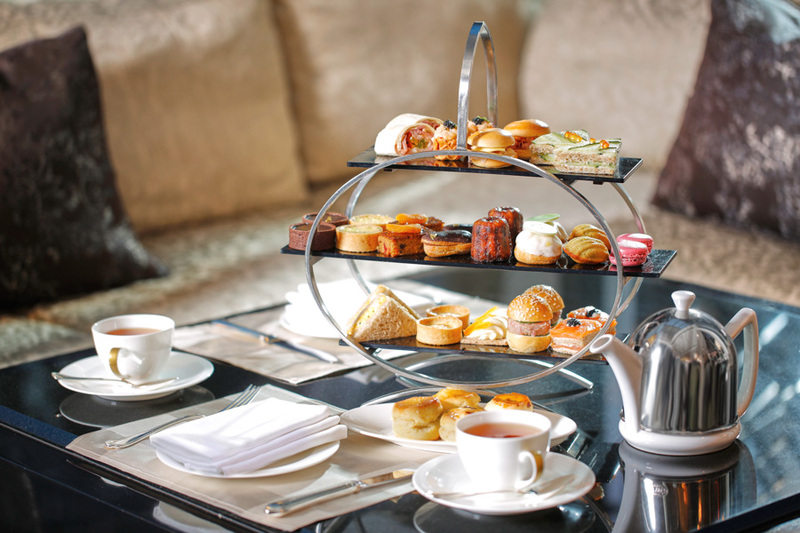 The popular Afternoon Tea menu features artisan pastries and other tea accompaniments in a modern chic ambiance. The menu is seasonal and changes bi-monthly, although there are staples like the freshly-baked scones served with clotted cream and homemade jams. You could catch these scones flavoured with ingredients in sync with the season. Relax as you sink into its plush pink couches, with your hot cup of tea served in elegant white porcelain cups made by Legle, a renowned French heritage brand of tableware. For drinks to unwind in the evening, try The Roaring City, a fizzy mix of Sparkling Pineapple Tapache and Vermouth Jelly. For something comforting, try Tea Time with Javanese Bourbon Tea with Arrack Cashew Cake. A zesty option would be 7000 Leagues Ahead, made with Super Sonic Gin and Kaffir Lime Leaf Oil. – Offers not valid on eve of and on Public Holidays and as well as Eves of and on other special occasions including Christmas Day, Secretaries’ Week, New Year’s Day, Chinese New Year and 15 days of Chinese New Year, Valentine’s Day, Mother’s Day, Father’s Day, unless otherwise stated. 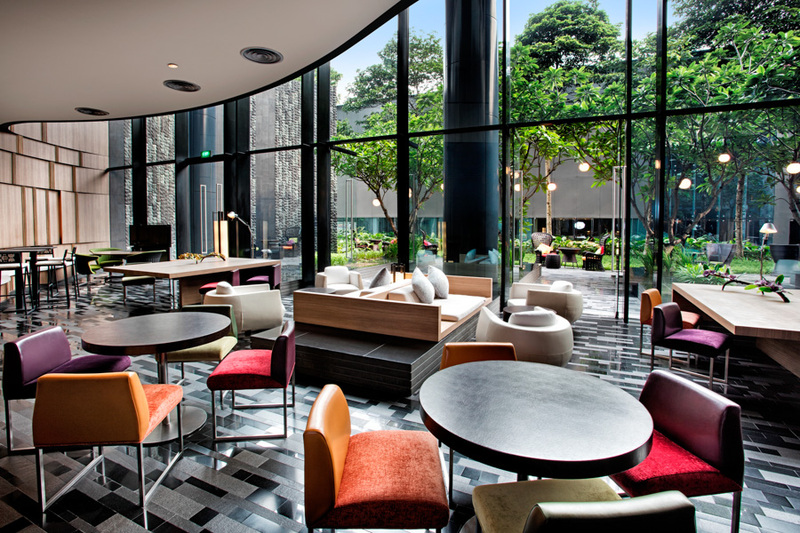 The Lobby Lounge of Crowne Plaza Changi Airport is another recommended venue for a stylish afternoon tea while overlooking a greenery-lined patio any day of the week. 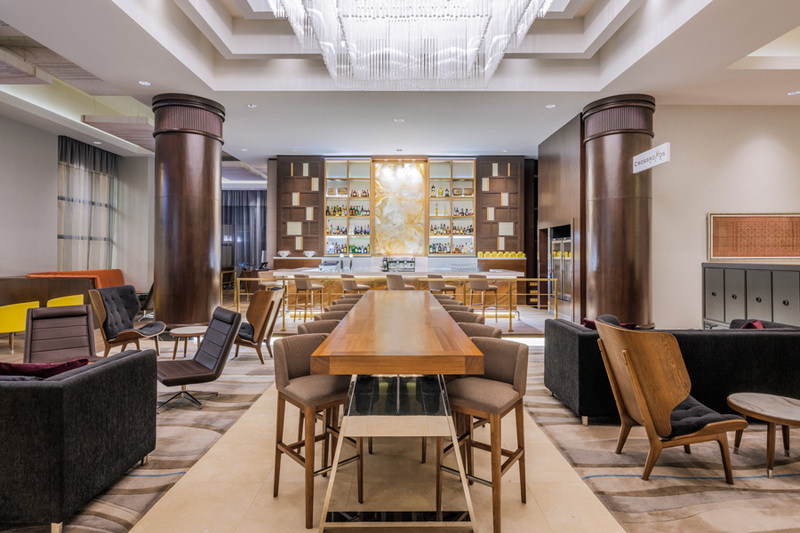 During the day, the hotel’s ceiling-to-floor windows allow natural lighting to fill the Lobby Lounge, setting a wonderful ambiance for your meet up with family, friends or business colleagues. 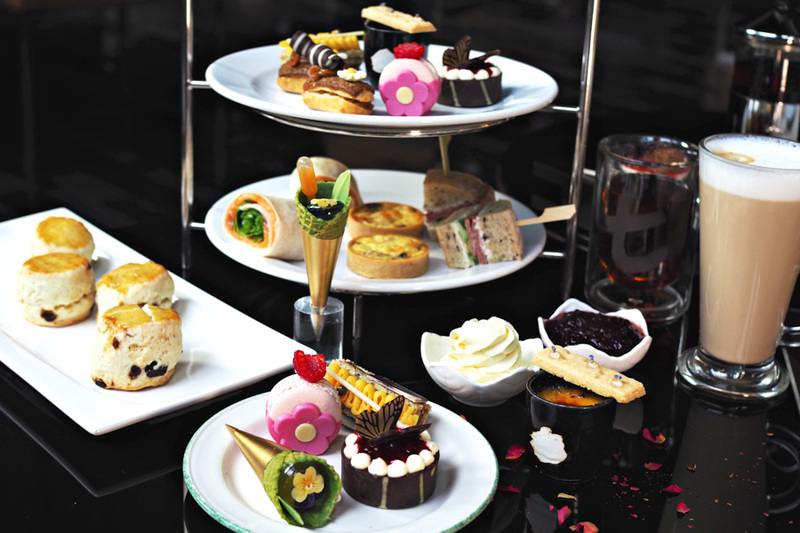 Discover what they offer in their high tea stand, a combination of classic confections and savoury snacks. Good for 2, the Floral Fantasy High Tea stand includes sweets like Lavender Honey Crème Brûlée (served with Lavender shortbread), Rose Macaron, Roselle-infused Cheese Tart, Sunflower-filled Praline Éclair, Pansy Green Tea Waffle Cone, and slices of Jasmine sponge. Savouries, like the Quiche of the Day, Smoked Salmon Wrap, and Ham & Cheese Sandwich, are there to balance off the flavours. The set also comes with the traditional scones with clotted cream and jam. For your beverage, you can have either tea (they use the gourmet Dilmah t-series) or coffee. –	Not valid in conjunction with other discounts, promotions, vouchers and privileges. 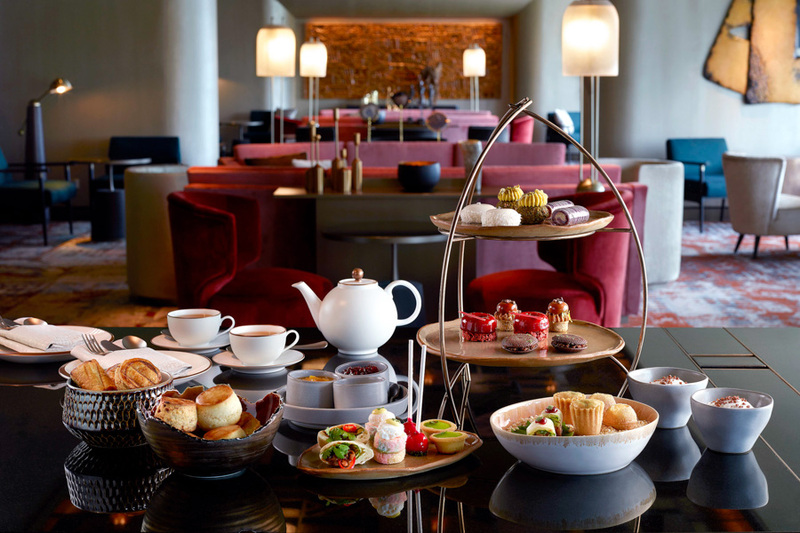 Sofitel Singapore City Centre offers a daily mid-afternoon tea in 1864, their stylish tea lounge on the 5th floor. With a range of seating options that can cater to a couple or a group of 10, 1864 is an ideal venue for casual or business meetings. Discover fine tea blends from around the world. Highly recommended is the Singapour Je T’aime Tea, a TWG green tea blend exclusively crafted for and served at Sofitel Singapore City Centre. It’s a symbolic tea to represent the cultural ties between Singapore and France. Made with sweet notes of lavender and rose, this cup of tea brings an elegant floral bouquet on the palate. Pair your tea with 1864’s signature bite-sized snacks and desserts served on a four-tier stand, including the Smoked Atlantic Salmon Sandwich with Buckwheat Blinis, Citrus Crème Fraîche and Caviar; Homemade Gougère with Béchamel of Emmental Cheese; and Smoked Quail Eggs with Truffled Aioli Tartine. Sweet tooths will love the Quenelle of Valrhona Chocolate Ganache on Brioche, a signature dessert. Their mini scones are freshly-baked and served with berry marmalade, mascarpone and berry coulis. The High Tea Stand comes with your choice of a pot of tea or two cups of Nespresso coffee. – Cannot be combined with other discounts and special promotions. – Payment must be made with a HSBC Credit Card. – Offer is subject to prior reservation and availability. – HSBC and 1864 reserve the right to vary or withdraw any of these terms at any time without prior notice. 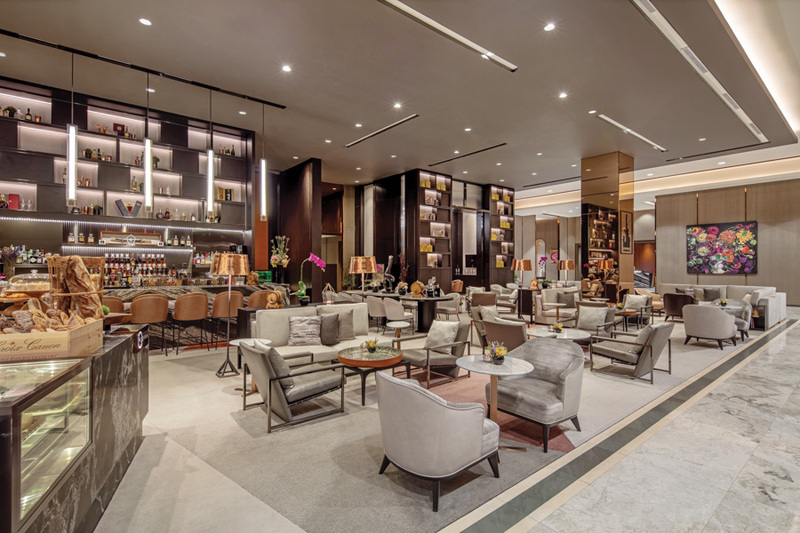 While other hotels offer a more traditional version of the English tea, the Lobby Lounge at The Westin Singapore gives it a twist by focusing on something atypical. It offers not only a plate, but a wide array of seafood-inspired treats. 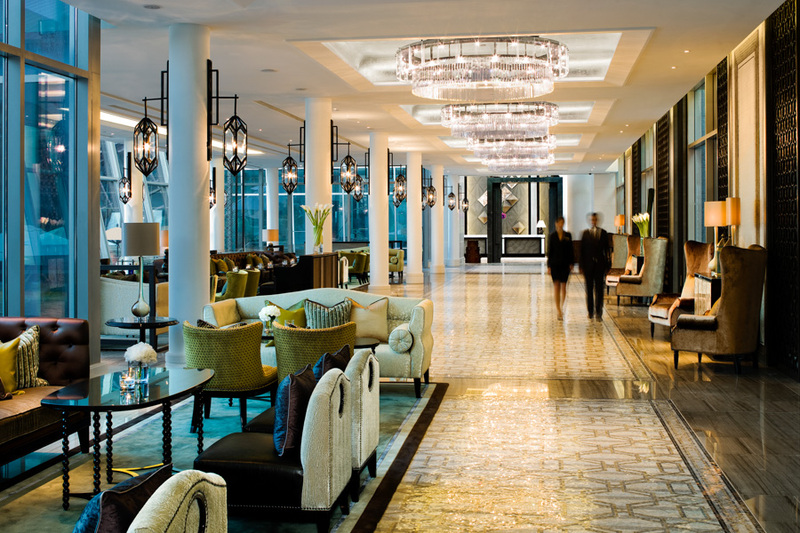 Known for its extensive menu of fine wines, beers, champagne and expertly mixed cocktails, the Lobby Lounge is also your High Tea place, complete with comfy sofas and breath taking views of the city. The three-course Seafood Afternoon Tea set includes Starters, Mains and Desserts. For starters, expect a medley of savoury seafood in their three-tier tray, in form of rolls, salad, and grilled items. Highlights include Mini Lobster Roll, Seared Scallop Waldorf Salad, and Grilled Marinated Prawn. On a slate, they’ll serve the mains, a whole Lobster Thermidor, wonderfully rich and cheesy, and two freshly-shucked oysters served with three sauces – champagne dressing, lychee bourbon and shallot vinaigrette. For desserts, revel in their colourful platter of delectable pastries and baked munchies like cookies, mini cakes, and tarts. Make your afternoon tea extra special with a glass of Italian sparkling wine. –	The offer is not valid on eve of and on Public Holidays as well as blackout dates and special occasions. –	The offer is not valid in conjunction with other discounts, membership privileges, offers, promotions and vouchers. Beast & Butterflies is M Social Singapore’s main dining hall, a flamboyant social space offering Modern Asian cuisine with Eastern and Western influences. It’s big on communal dining, believing that food and drinks bring people together. Their 13-meter bar counter is where the social interaction happens over artisanal cocktails prepared by their In-house mixologists. Aside from the drinks, Beast & Butterflies offers a Weekend Brunch. Experience their signature starters with modern Asian flavours such as the Roasted Duck Chawanmushi – made of steamed egg with roasted duck, Ikura and spring onion; and Thai Pie Tee made of Thai minced chicken salad served in pie tee shell. 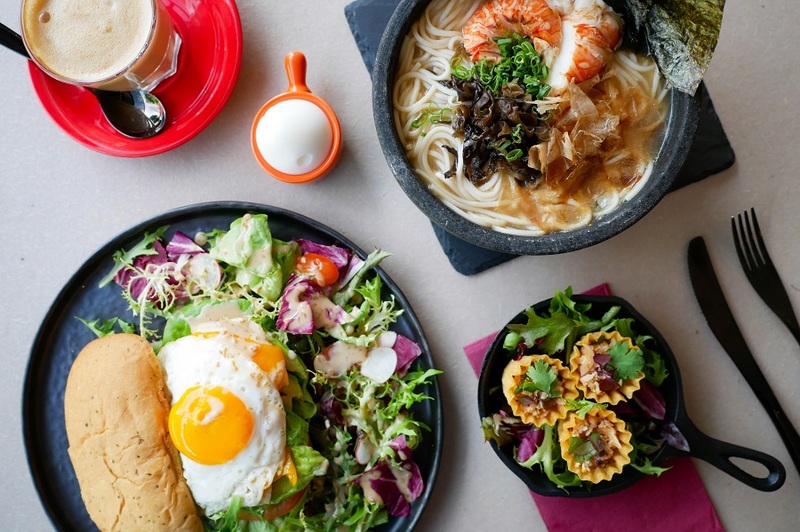 For mains, sink your teeth into their Focaccia Sandwich – grilled chicken with avocado, sunny side egg, cheese, lettuce and tomato in focaccia bread; Crispy Pork Knuckle served with sesame oil scented Asian sauerkraut; or Lobster Ramen in rich kani miso broth. –	All promotions are not valid with other ongoing promotions, offers, vouchers, discounts, promotional set menus, privilege card(s), loyalty programs unless otherwise stated. –	Offer is only valid on Weekends i.e. Saturdays and Sundays. 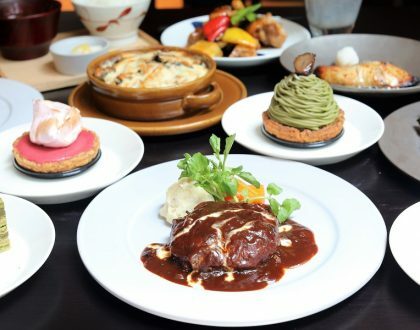 –	50% off 2nd diner is only applicable to the Weekend Brunch Set Menu and available from 2pm to 5pm only. –	Prior reservations highly recommended and subject to availability. –	Prevailing restaurant terms and conditions apply. –	The hotel reserves the right to revise the governing terms and conditions without giving prior notice. 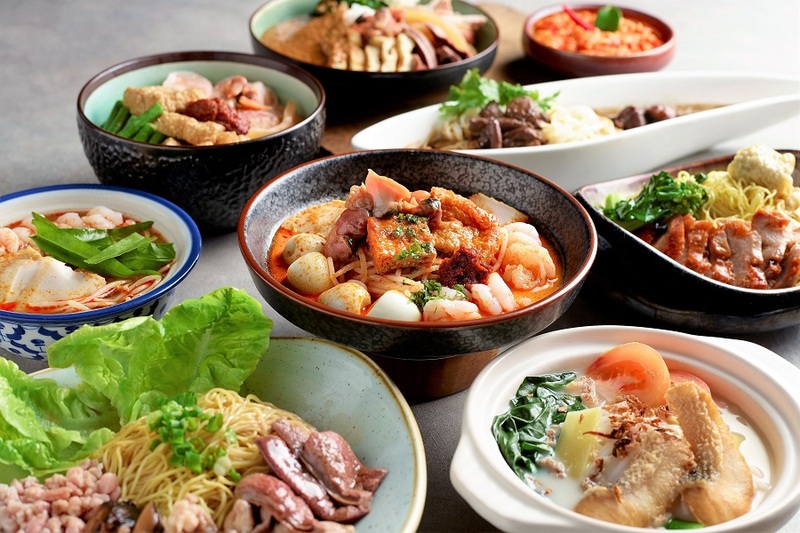 For more details on the latest #HSBCDining promotions, hop on over to www.hsbc.com.sg/dining. Terms and conditions apply for all promotions herein. *This post was brought to you in partnership with HSBC Credit Cards.